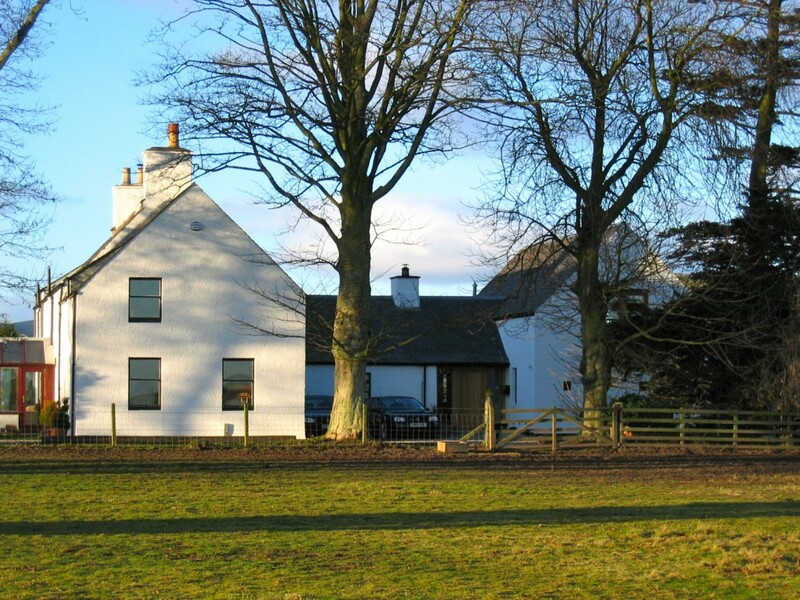 An extension to a Perthshire farmhouse in a traditional steading. The farmhouse sits apart from the courtyard of traditional stone barns and this extension presented the opportunity to complete the courtyard with a new ancilliary building. The farmhouse faces south and the existing entrance was through the kitchen. the new extension provides a new formal entrance to the east with a large family kitchen dining room with a guest suite over. The building group is exposed to the prevailing west wind so the upper guest room benefits from an internal window looking through the double height space and the large picture window in the west gable preventing wind noise. The new front door is on the east side sheltered from the prevailing wind. Architecturally the new extension is separated by glass and timber elements and the white render and clean gables links the new to the old. The exposed steel and timber floor joists and natural materials add a contemporary interpretation of traditional construction methods. Auchenhard House lay rotting and completely overgrown with the lower floor used for storing cattle by the Farmer. Historical records proved this to be the original small estate of “Paraffin Young” and included not only the small Georgian House but a hunting tower set in an open paddock. 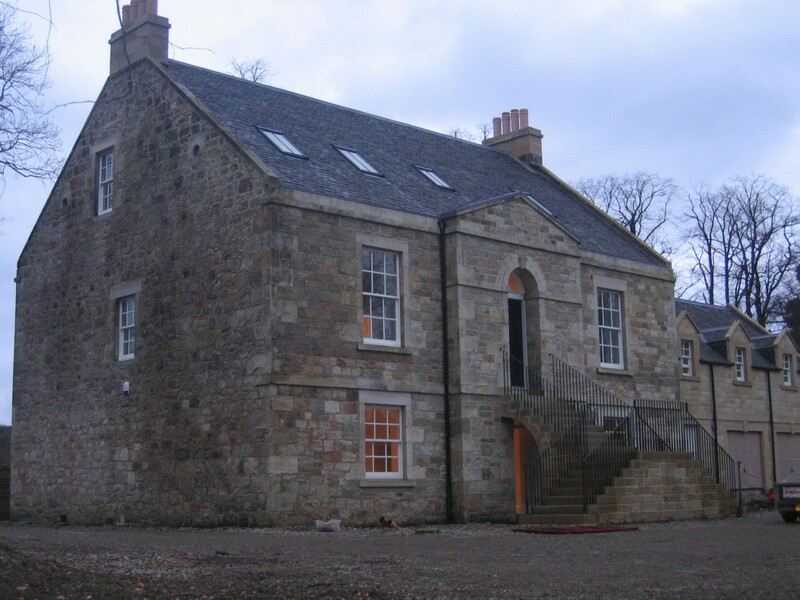 Our project was to restore the original house and include modern facilities and a large garage. Research was carried out and Historic Scotland heavily involved. The final results show the full restoration of the house retaining the original features throughout. The setting of the house is being recreated by the owner. 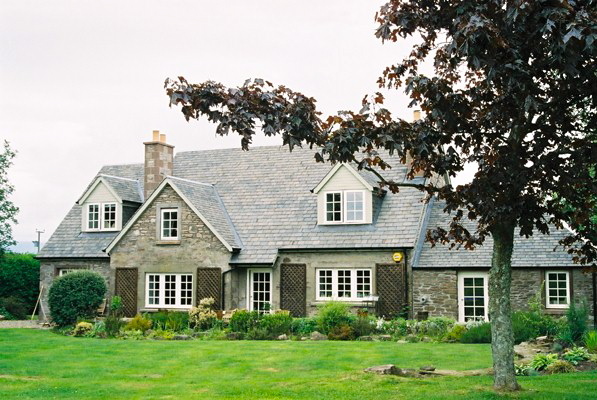 The Cockit Hat is a traditional Perthshire farm cottage set in a small holding of land with traditional stone barns forming a small courtyard. The original cottage had earlier extensions which spoiled the roof lines with poor wall construction and finishes. A new roof now covers the original footprint which provides generous accommodation upstairs and the ground level has been extended into the adjoining single storey barn to form a dramatic living space. A new outer leaf of stone was constructed to match the existing and the whole group now looks original. 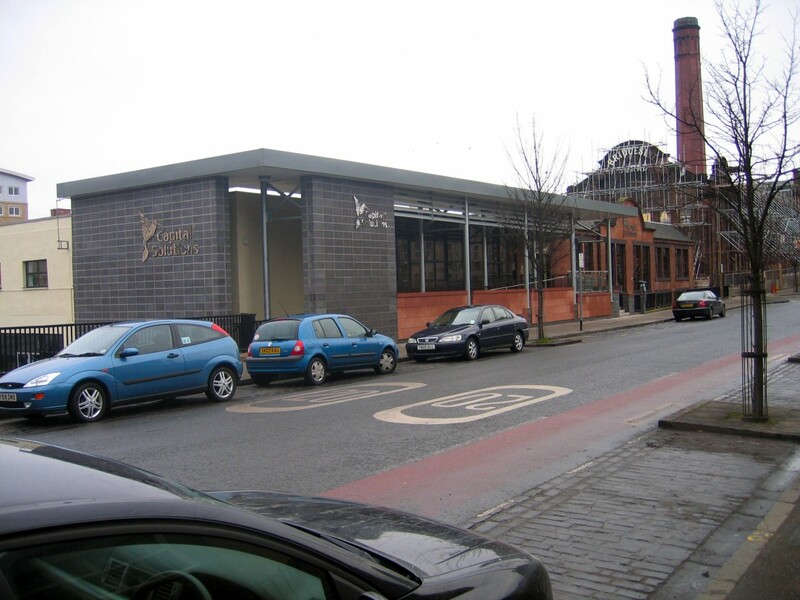 The existing west facing offices suffered from solar overheating and the existing entrance lacked disabled access. The showroom lacked connection to the main offices and additional staff canteen quarters needed updating. The solution was to create a new external ramp with a roof to create shade for the overheating offices and to redesign the entrance steps to have more impact. A new reception area was created and internally a new spiral stair was inserted to open up the showroom to the lower offices. A new staff cafe was created on the lower floor. The company underwent full re-branding of which the building became an integral part. The Client wanted to create a shooting lodge appropriate for its setting, taking account of the magnificent views and built of traditional materials. 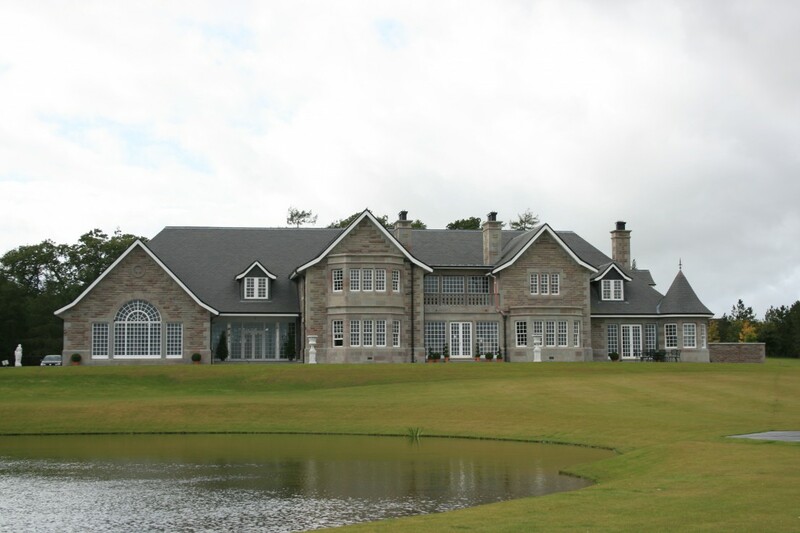 Kirkton Park is a large and luxurious country house. It is orientated to welcome the visitor in a formal and embracing south and west facing courtyard and the plan is organized around a series of major axis’. The views through the house reach out into the landscape to the north and east, and the house is penetrated by natural light. The open landscape design allows for clear views to the Angus hills and the foreground is dominated by the new pond. 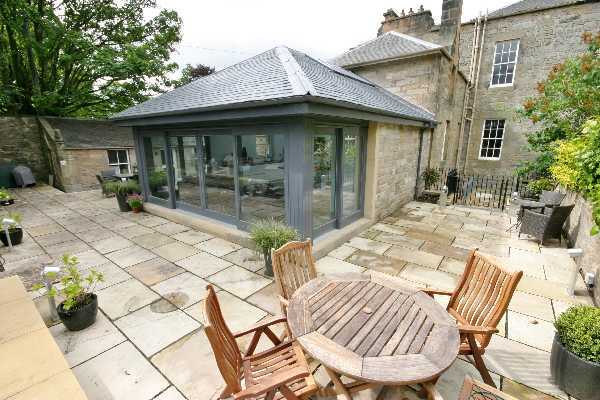 A new kitchen extension onto a listed Edinburgh villa. The existing house is a semi-detached villa in the Blacket Conservation Area. It had a modern conservatory falling into disrepair, and the brief was to replace the conservatory with a kitchen family room, linking the house to the garden, and upgrading the rest of the house. The new extension opens the house to the garden and the new kitchen is flooded with natural daylight. A new stair was inserted to the basement to allow direct access from the side door for the family dogs, and this lower floor has been completely refurbished to include a laundry and a home office.